Founded in 1972, The BrasilianS Newspaper has promoted and reported on Brazil for 45 years. It’s the oldest bilingual (Portuguese – English) newspaper published in the United States and the most complete publication in terms of relevant content to anyone interested in Brazil and its people. Fast forward to December 20, 1986 when entrepreneur João de Matos, bought the newspaper. He has published it since then. The BrasilianS has grown from a circulation of 2,000 in 1986 to 35,000 in 2016. Through the years, the paper has built an audience which includes Americans. These are people interested in learning more about Brazil and its people. It’s especially important to the Brazilians living here in the US. The newspaper gives them a feeling of closeness to Brazil. Readers of this monthly publication are a very diverse group. The BrasilianS represents a link to Brazil. Articles include selections of business, cultural, and tourism. Current events that are rarely given space by other community media publications. 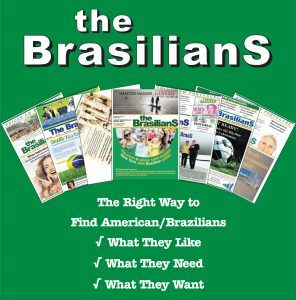 The circulation of the The BrasilianS is about 35,000 copies printed and audited monthly. Of this total, about 33,000 are mailed to regular subscribers throughout the US including Alaska, Hawaii, Military & Diplomatic bases. The remaining copies are distributed in strategic points, such as Brazilian businesses in the New York tri-state area, Massachusetts, Illinois and Florida. No other Portuguese language newspaper has a national distribution to subscribers, who receive their copy in the comfort of their own homes. The BrasilianS is much more than a newspaper. It is, in fact, a source of news that makes a difference in understanding the relationship between Brazil and the United States.